Macy's (originally R. H. Macy's) is a North American department store chain, originally headquartered in New York until 1994. The company expanded through buyouts of various department stores and companies. Macy's status as an independent company ended in 1992 after filing for bankruptcy. The company was later bought by Cincinnati-based Federated Department Stores in 1994. The company moved its headquarters to Cincinnati that year. From 1995-2005 Federated began to fold its less popular chains such as Stern's, Lazarus and many others into Macy's. 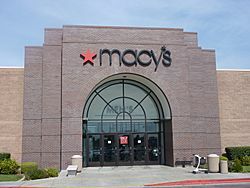 In 2005 Macy's acquired rival The May Department Stores Company creating the nation's largest department store holding company, with over 800 locations. On September 9, 2006 Macy's became a national brand after Federated retired the former May regional chains. In 2007 Federated announced it would re-brand to Macy's, Inc. as an effort to focus on the Macy's name. As of 2016 Macy's has stores in 45 states. Macy's at Paramus Park shopping mall in Paramus, New Jersey. Macy's Facts for Kids. Kiddle Encyclopedia.